Add this to your shopping cart and check-out to download the info flyer for this course. The Info is for the 2019-2021 course. trimming a hoof to restore or maintain physiological hoof shape and functions. They also understand and consider the complicated interactions of the hoof with the horse as a whole, and the effects that hoof problems and diseases can have on the entire organism. holistic and alternative healing methods are part of the holistic, non-invasive approach the SHP has to aiding in the restoration or maintenance of a horse's soundness. The SHP also functions as an advisor, counsellor and teacher, educating clients about the horse's requirements for a lifetime of soundness. He or she does not advocate the use of chemicals, drugs, pads, or horseshoes to cover up a symptom (for example, lameness) but, by removing the cause and restoring proper hoof shape, facilitates the healing of the underlying damage or deformation causing the lameness. The goal is not to restore the horse to usability as quickly as possible, but to allow healing to occur, leading to a full lifetime of soundness. This course runs over 2 years and consists of extensive theory work as well as practical sessions. At various points throughout the course there are exams. In order do keep the work quality high, the SHP is required to attend an annual Continueing Education seminar. 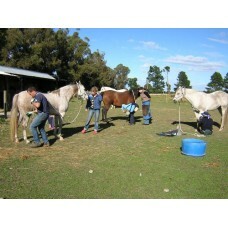 This course is instructed by Thorsten Kaiser of the Institute for Barefoot Equine Management.